How can we consciously realize the consciousness concept? First, consciousness is beyond concepts – language, which is dualist, allows talking of it as if separate from the subject, thus conceptually. 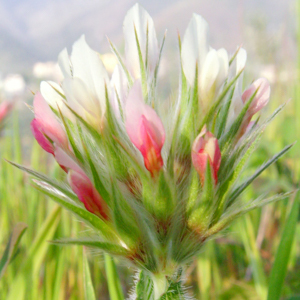 But consciousness is a prime reality, the foundation of everything existing; same as being (which are not two). Consciousness is first, an immediate reality and, accordingly, you don’t have to do anything to realize it since you are it. Only, let the veil of ignorance drop, mostly by ‘not this, not this’ – one apavada after another; that is, by real understanding or discrimination. You are being itself, consciousness itself. The knower cannot know itself – as an object. Who would win in an argument between Ramanujacharya and Shankaracharya? As non-duality can be said to go beyond, and at the same time enclose duality within itself, we can also say that Shankara, being a non-dualist philosopher, goes beyond and ‘incorporates’ Ramanuja, that is, the latter’s philosophy (it has been said: a jñani understands a bhakta, not vice versa). Ramanuja took the ego (psychological self) as being the Self, an error for an Advaitin. For the former a destruction of the ego (“me”) will thus entail destruction of the Self. For an Advaitin, the ego or subtle body (mind, senses and vital breath) dissolves when the body dies – not so awareness or pure consciousness. From the viewpoint of Advaita Vedanta ‘consciousness’ is another name for ‘reality/being/existence’: all there is or that can be (all possibilities of existence). Neither ‘subject’ nor ‘object’, it annihilates this (mental) division, as well as sublating all concepts. ‘An enlightened person, after his death, does not undergo a change of condition – something different than when he was living. But he is said to be “merged in Brahman” just due to his not being connected to another body.’ Quoted from ‘The Method of Early Advaita Vedanta’, Michael Comans. 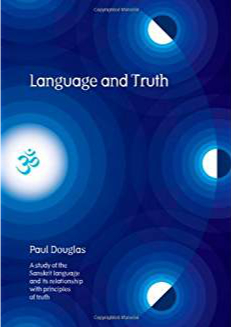 The ability of Sanskrit to convey truth expressed through the vision of advaita is the holy grail pursued by Paul Douglas in ‘Language and Truth’. The explicit influences on Douglas’s understanding of Sanskrit come from two main sources: his spiritual guide, Shantananda Saraswati, one time AcArya of Jyotir Math in BadrinAth, and the linguist and grammarian BhatRRihari. In that sense it is a devotee’s book, a book that explores the language to validate the teachings of the guru, in particular, one of his statements: ‘The grammatical rules of Sanskrit are also the rules of creation’. 1) Knowledge and the Vedas; 2) Is everything metaphysical? I would say the Vedas contain the most fundamental and ‘advanced’ knowledge there is, though usually portrayed in the form of paradox (analogy, metaphor, story, etc. ), so that one has to crack the code in order to find the wealth hidden in them. That knowledge is not like empirical science, which is cumulative and provisional, and can be said to be somehow contained in the latter, even if in embryonic or potential form. That knowledge or perspective is metaphysical rather than mystical. According to the Vedas there is one and only reality: consciousness (brahman, the Absolute, etc. ), which pervades the whole universe; it is immanent in it as well as transcendent… “the smallest of the small, the largest of the large”. It cannot be measured or understood by the mind, for which it is ineffable, but it is that by which the mind comprehends… it cannot be expressed in words but by which the tongue speaks… it is eye of the eye, ear of the ear, mind of the mind, as expressed in the Upanishads. Modern physics is having a hard time trying to explain away what consciousness is in terms of physical phenomena (neuronal activity in the brain), but consciousness is not an irreducible phenomenon or datum; it is reality itself, everything being comprehended in it (theories, doubts, projections, emotions, things, thoughts, intelligence, observer and observed, you and I). For the Vedas reality is one, and present physics is trying to find out in which way it is so (‘theory of everything’, ‘unificatory theory…’). Not all physicists are reductionist, some of them having seemingly mutated into philosophers with an understanding of the core of Vedic teachings. ‘Is everything metaphysical?’ My answer is a resounding Yes! despite the widely accepted, prevailing, physicalist theory: everything is reducible to matter/energy. This last position is being insistently questioned ever since the rise of the new physics (the role of the observer, uncertainty principle, etc.). Nobody knows what matter is intrinsically, and why an atom is an atom – its nature is a mystery; scientifically we can only talk about mechanism, ‘behavior’ or function, in relation to physical processes. Thus, everything is metaphysical – including tables and chairs or, rather, the material they are made of, wood (hilos) – which means non-reducible to the physical. Psychology, mind, selfhood are equally non reducible to the physical – nor are they purely mental or purely conceptual – , thus they are metaphysical, however psychologists may protest. ‘Man’, ‘personhood’, are metaphysical or philosophical notions. Metaphysical doctrines are couched in LANGUAGE (concepts, plus logic and reasoning -tarka), which de facto is dualistic, but that is a springboard and a conditio sine qua non for realization or uniting with the TRUTH or REALITY which is indivisible, non-relational, and inexpressible by the mind (anubhava). Q: Is the following summary correct? The universe is pure consciousness (nondual) – one big mass of it – that manifests (at least, in the illusory sense) as separate forms, objects or organisms. The reason(s) it does this are ultimately unknowable, but speculations include out of playfulness, to know itself, or due to boredom. A: There is only Consciousness so, yes, you can regard the universe as Consciousness also. But don’t think of it as a ‘mass’, since that would imply a ‘lump’ of it existing in something else, and there is nothing else. Is soul different from consciousness? I agree with the responders here that equate both concepts – soul and consciousness – which in themselves are just pointers to what is real/reality. Reality can only be one, not multiple; thus, to make a distinction between soul and consciousness, or between spirit and matter, God and the world (or ‘I’), experience and knowledge – or between Brahman and Atman – is either provisional (an intermediate doctrine or teaching) or confusing and limiting. Q: As I see/feel it, Truth (with a capital T) is a human concept, and like all concepts, is not real (except in our minds). “What is” is simply “what is” … period, end of story (literally). Advaita Vedanta seems to say that Truth (Brahman) is real, that it is in fact the only reality. If they are, is my take that ‘Truth is a human concept and therefore not real’ a deep obstacle (perhaps even a show-stopper) to my studying Advaita? A: It is not possible to talk about brahman/reality because it is non-dual and without attributes (see Q. 328). You need to accept/appreciate this. But of course, as part of the process of removing self-ignorance from the mind, we do need to ‘as if’ talk about it. And we do this via pointers, negation and so on. All of these are concepts and have to be dropped IN THE END. But, in the interim, we make use of them without worrying about the fact that they are mithyA. The other point is that words are very slippery things and different people can understand different things. The word ‘sat’ can certainly mean both ‘reality’ and ‘truth’ (as well as ‘existence’). Whether or not you regard these as synonyms may cause you a problem of the sort you describe. But the word ‘reality’ is as much a concept as the word ‘truth’! These are the sort of things that twentieth century Western philosophers argued about. Don’t worry about it! Gain Self-knowledge and you can then happily drop all the concepts, or simply use them as appropriate when you want to talk to someone who doesn’t have Self-knowledge! Developed originally in America, and to some extent in rebellion against the metaphysical theories current in Europe at the time (especially Idealism), Pragmatism is effectively a method for determining the worth of philosophical problems and their proposed solutions. What was thought to matter was not all of the intellectual speculation and theorising usually associated with philosophising but the practical worth at the end of the day. Is a theory actually of any use to us in our day to day life? Will it make any difference to me if I follow it or am even aware of its existence? The word ‘pragmatic’ has now passed into everyday usage as referring to an approach that actually works. The discussion that follows stems from a comment I made on a recent article in the July NOW Newsletter. This is produced by a group in Australia led by Alan Mann and is a resource for the works of Thomas Traherne, as well as Douglas Harding, John Wren-Lewis and George Schloss. I publish our email exchanges verbatim, as they occurred, below. Please feel free to add any useful comments! Does a chair exist? As a chair? What if I remove the legs and back; is it still a chair? Was it a chair a year ago, 10, 100, 1000 years ago? What about similar periods in the future? I suggest that it is not the chair that exists at all, it is the wood out of which it is made. (And the same argument applies to the wood over longer timescales.) A ‘chair’ is not real; it is only name and form of wood. Etc. ‘Things’ are not real; no ‘thing’ exists in its own right; it is dependent upon something more fundamental for its existence. And this goes on, all the way back to Consciousness. Have you read the story I wrote about this? 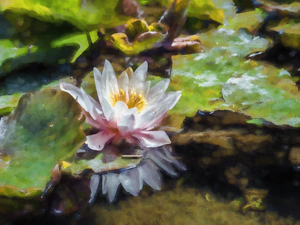 – the ‘first definition’ at http://www.advaita.org.uk/discourses/definitions/advaita.htm. You can publish this in your next edition if you like.